Anyone establishing a small business or creative space in Melbourne probably needs deep pockets, and a well of patience to find a location that's suitable and available. With low vacancy and some of the world's highest retail rents – more than $5000 per square metre each year in the CBD's prime locations – it's no wonder people are seeking alternatives to traditional shops. 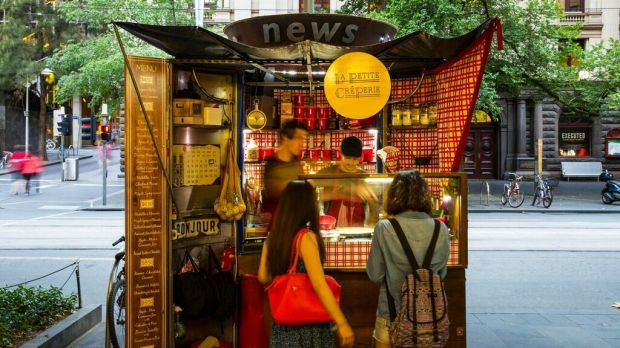 Shopping centres' wide thoroughfares are dotted with kiosks and carts, food trucks are thriving and, in the CBD especially, neglected nooks and crannies are getting a new lease on life. From former switchboard cupboards to old newsstands, those who can think outside the box are moving into small spaces that landlords are only too happy to make available. Melbourne's 21st century laneway culture has seen locals and tourists alike fall in love with obscure, unexpected places. Our favourite little spaces are often part of that, and sometimes an extension of it because, far from being hidden, some are in plain view. Straddling a narrow thoroughfare in the Manchester Unity building's arcade, this business may be Melbourne's cutest. On one side: seating in what looks like a miniature department-store window, where perhaps six customers can cosy up. Two steps directly opposite is where the Switchboard Cafe magic happens: a literal hole in the wall, formerly housing a switchboard, now used to prepare drinks, sweet treats, bagels and jaffles. "People are absolutely gobsmacked that you can produce cafe items and coffee out of such a small space," says manager Claire Cordwell. They "seem to be absolutely in love with the fact that it's under a staircase". It's popular with social-media snappers and tour groups, but the quality of the fare has kept paying customers coming back for 14 years. That, and the novelty, means Cordwell doesn't encounter grumbles when occasionally needing to access storage under customers' seats, or the drop-down ladder above that leads to space hidden in the ceiling. It's about having a place for everything and everything in its place, so "the only challenge", she says, is at busy times when the serving bench is covered with dishes. The bench lifts up, creating the only way in and out of the kitchen-for-one. Another wonder-under-the-staircase is this CBD offshoot of South Melbourne Market's Agathe Patisserie. There's only room for about 150 pastries and biscuits in what's essentially a serving window, so "we have to organise several deliveries each day", by bicycle courier no less, says owner Agathe Kerr. "It's not about money," she explains. "I love that space." 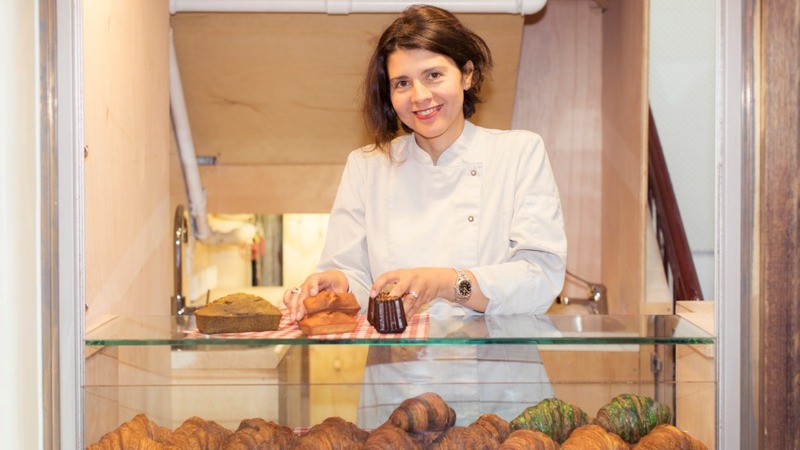 A Parisian who moved to Melbourne with her Australian husband in 2013, Kerr started selling her French delights at school markets before moving up the market hierarchy. She likes the CBD's bustle and architecture, so inquired about Royal Arcade's open kiosks. "They said they had another space," recalls Kerr. "It was small and quirky, and I decided, 'yes, that's it, I want it'." It was difficult to get approval for a food business in this former key-cut shop – which is also a fire escape, so the fit-out had to be simple. "At one point I thought it would never work," says Kerr, but Agathe Patisserie Petite finally opened last year. About 300 items are sold each day, with croissants the most popular. On Fridays it's more like 400. There's also plenty of leche-vitrine – literally "window licking", or window shopping: tourists are often surprised to see a patisserie in such a little space, says Kerr. "That's what I love about Melbourne," she adds. "These weird places that you wouldn't find anywhere else … Cute, amazing places that do really good products." For eight years, Jon Freeman has worked with co-owner Courtney Patterson in their 1.5 by 3.5 metre espresso bar. "We seem to manoeuvre around each other quite well," he says. "It's almost like a dance." 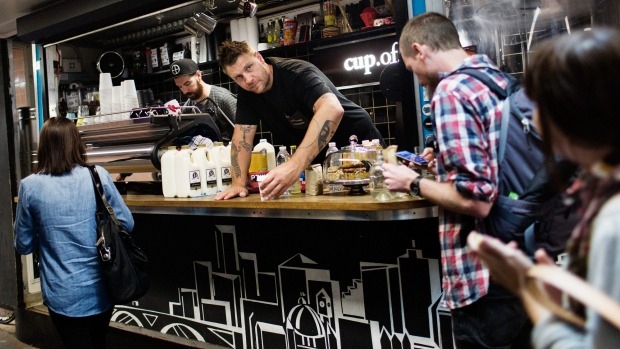 Customers comment on Cup of Truth's size less often these days, because other standing-room-only coffee joints have begun popping up in Melbourne, but it remains a favourite "small shop with a big personality", as Freeman says. This space under Degraves Street was previously a sandwich shop. Freeman believes it was a tobacconist before that, as he chanced to meet a man who helped his father there after school as a boy. Its future is in doubt as, according to Freeman, Campbell Arcade's tenants must vacate by July 2019 because of the Metro Tunnel. He was nervous when the project's ramifications began filtering through, but is now "very excited … because we're starving for sunlight!". Freeman's also reassured by the belief that "we have a business model and a formula that could pretty much work anywhere". With any luck, another distinctive small space will present itself, but for now it's business as usual. So countless cups of coffee, whether a custom blend from Axil, rotating single-origins, cold drip or batch brew (aka American-style percolator coffee). There are also "grab and go" cakes by their fellow alumni from Shannon Bennett's Vue empire, pastry chef Matt Forbes of Yarraville's Cobb Lane. "It was never a goal but, yes, we are the smallest bar in Australia," says Matt Bax, owner of this laneway establishment with room for just 10 standing patrons. 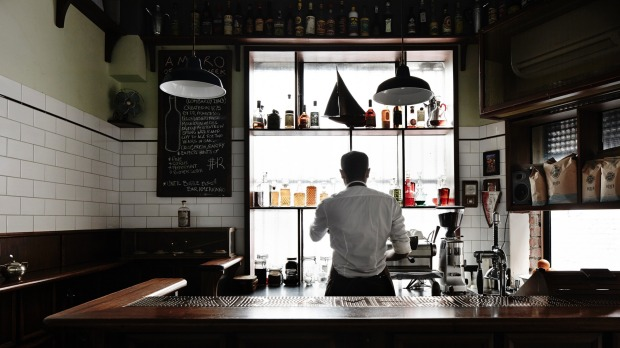 "The number isn't important, it's what you do with it," he adds, noting that there are two or three staff "so service and drinks are more attentive". "I was actually looking for a bigger space for another concept … when I found Presgrave Place," says Bax, best known for pioneering cocktail bar Der Raum, late of Richmond. "It was a perfect fit for this idea of an American bar, the correct term for a classic European cocktail bar." Bar Americano opened in 2011 after a complete refit; its chequered floor, wood panelling and vintage bottles evoke the Continent between the wars. The minuscule art gallery built into the entrance by previous tenant, Pushka espresso bar, was retained, however. An artist himself, Bax continued to curate this diminutive glass case for a period, and plans to relaunch it as an art space this year. Origami cranes folded by customers are currently displayed there. As for drinks, the cocktail menu changes every week, with newcomers developed at an off-site studio "10 times the size", says Bax. About 80 per cent of the menu is perennial favourites, however, because "the idea was to establish an institution known for a handful of really bloody good apertivo classics". Is this Melbourne's tiniest art gallery? Among the subdued Art Deco styling of Pawson House's modest foyer are 19 original wooden mailboxes, transformed into a cohesive strip of pocket-size exhibition spaces in 2006. According to Mailbox Arts Space co-director Louise Meuwissen, the building's owner "wanted to provide an arts platform", so refurbished the heritage mailboxes, including replacing the front panels with glass. "I think he doesn't understand why there aren't more buildings doing something similar," says Meuwissen, especially heritage-listed spaces that can't be fundamentally altered. "You wouldn't be able to remove those mailboxes to put in new ones, so why not utilise those spaces to be activated by artists or other creative people?" This free alternative to what she describes as the "white cube gallery" provides opportunities for both emerging artists and emerging arts workers. There have been several directors since Mailbox Arts Space's inception, with Meuwissen, Andy Butler and John Brooks taking over the voluntary position between them this year. The current exhibition, Hootan Heydari's Quarantine the Past, is the third they have curated in this space so small that exhibitions can be turned over literally overnight. Its size also imposes constraints, but "pardon the pun, we do encourage artists to think outside of the box", says Meuwissen, laughing. As a result some artists have "also used the wall space, the stairwell and surrounding parts of the building". Nestled among Melbourne Central's 56,000 square metres of retail space is this nook where giving is as common as taking. The Little Library is a book exchange, where shelves are generously filled with novels, from Pulitzer Prize winner Anne Tyler to vampire queen Stephenie Meyer, Lonely Planet guides and Chinese-language titles. The eight-square-metre space was set aside to "create a sense of community, and give people a reason to see that Melbourne Central isn't just a shopping centre", says Justin Shannon. 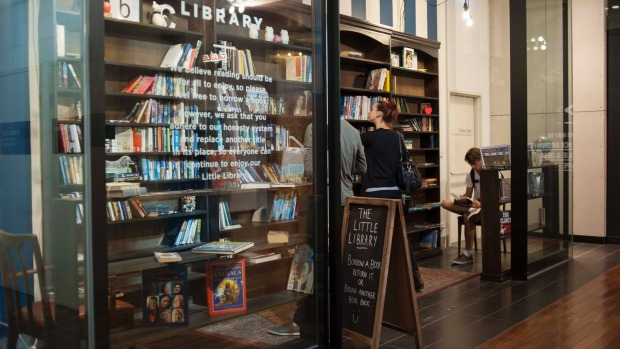 The regional general manager for Melbourne Central's owner, The GPT Group, adds that The Little Library, which opened in 2012, is fundamentally about "promoting literacy and the love of reading". Numbers aren't monitored, but Shannon knows it's well utilised because he sees the turnover when exchanging books for his young children. When we visited, there was a constant flow of people coming, going and lingering, including a reader on the leather armchair. Melbourne Central organises the library's cleaning, facilitates book donations, adds books from storage if shelves are depleted, and accommodates author readings. Otherwise it's self-regulating. "Some people have become quite attached to it … [and] turned themselves into curators," says Shannon. "I think it reflects the growing number of residents … in this northern part of the CBD." Not all users are local, however. "We've actually had tourists take a book … and post it back" from interstate or overseas, says Shannon. Jungle Juice Bar: Every business along narrow Centre Place is petite. Is this cafe with some tiny tables squeezed next to a kitchen bench the smallest?